Bella Luna is an oasis of comfort and tranquility in the bustling heart of Cairo. Our well trained staff are ready to answer any question you have and look forward to making your experience in Cairo and Egypt truly memorable. We offer: free breakfast, free luggage storage, information desk, free kitchen facilities, free WiFi, 24h security and reception, 24h room service and train and bus tickets reservation. 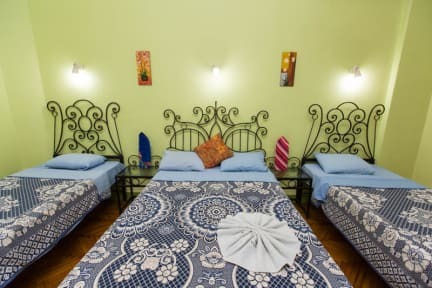 Our hostel is located in the most magical spot of Cairo. 300 meters away from the main bus station. 500 meters away from the Egyptian museum. 300 meters away from the metro station. 400 meters away from the Nile. 4 min. walking from the best clubs, restaurants, shopping centers and art galleries. Reception is open 24 hours a day and our young friendly staff speaks English, German and Spanish. We're happy to help you arrange city tours, city walking tours. There’s no curfew or lock-out. One of the best places in Cairo for it's value of money , safety , cleanliness and location Above all the staff is always ready to help at anytime and with valuable information and even tours around Egypt Excellent service. Well done guys , would definitely come back. The staff were very friendly. They were quite helpful when it came to planning activities and outings. Very trustworthy staff who were eager to help. Good location in town that the taxis know well. Not a modern decor but for the price this exceeded my expectations. Happily stay again. So I really liked the hostel and the receptionist at night is really nice. He helped me get sunscreen. The building the hostel is in is set back from the road and is kind of sketchy but the hostel is clean and nice. I didn't have a locking door which made me kind of nervous and check out is a 12. There is no option to stay at all past 12 which I didn't like but they did watch my bags so I could go exploring. Count on it taking a long time to go to and from the airport due to traffic. Spacious, super clean, quiet. Great place to stay for couples, groups, or solo. We stayed for one night so I can't say much for the social life there but there are tables and chairs around. The bedroom and bed were really clean and comfy, outlets everywhere. Staff was helpful and kind. Breakfast was average, eggs, bread, jam, nothing incredible. Wifi worked really well and the shower was clean and really hot! Location is right in the middle of Downtown, which is easy to access. Overall, great! The Bella Luna was in a good location near crosswalks and stop lights. I was really happy that I didn't have to fear crossing the street. It was also relatively easy to get a cab. The hotel staff arranged a driver for us to get to the Pyramids and the Sphinx. The rooms was relatively big with an ensuite bathroom. There was air conditioning, which was incredibly helpful in the height of an Egyptian summer. Overall, I enjoyed my stay at the Bella Luna. Would recommend if one takes a very-budget/back-packer minded approach to travelling. Was reasonably happy overall with my experience regarding Bella Luna in terms of bedding, bathroom and breakfast though security was a bit of an issue as door always seem to take several minutes to lock and unlock plus doorknob almost fell off prior to me checking out. The building was very dirty, but the hotel itself was okay. The staff were helpful, and they allowed us to check in early which was nice. This may explain why we did not have any towels or toilet paper in our room and had to ask for them. The shower was cold on the first day we arrived, but hot on the second.